for another exciting K.I.S.S. Crop!!! Only $20.00 covers your crop seat, some fun surprise goodies that we know you are gonna love and some yummy sweet treats! **Once you’ve registered you will get an email with additional details to more fun!! Register early and get a jump start on the fun! Limited to first 50 to register. ***Meals are not included however we welcome you to bring your own meals or order in. ***Our single day crops do not offer door prizes but we will have plenty of things you will love including a fun contest and some surprises!! FREE unlimited soda refills with the purchase of a K.I.S.S. Mug, $1.00 per can otherwise. Free water, tea and lemonade are always offered, please bring your own cup. The 1st month of K.I.S.S. Club Creations is now in route to their new homes. 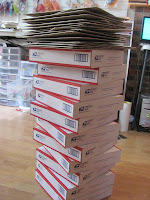 If you don't see your name in this stack be sure to sign up so you don't miss another month! !